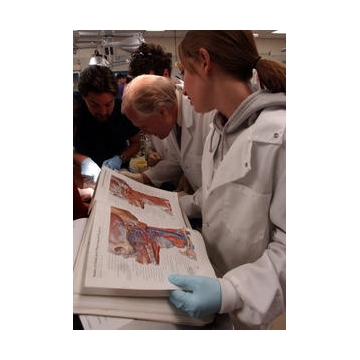 The human anatomy lab is where a future physician will meet his, or her, first patient. The patient-a human cadaver-is one of the most important teachers the student will ever encounter, and their meeting is a "rite of passage" for medical students. Each year at the UNM Health Sciences Center, about 90 future physicians and physician assistants (PAs) take the human anatomy course, which covers basic descriptive, functional, clinical and radiological human anatomy. For 12 weeks, students examine donated bodies that have been preserved in formaldehyde-free embalming fluid. The knowledge the students gain is a critical part of their education and future as health care professionals. The experience, they say, is unforgettable. "It's a good initiation into medical school," said Tropha Wright, a first-year medical student from Chaparral, New Mexico. "The moment you walk into the gross anatomy lab, you realize you are part of a very select group of people-you are going to be a doctor-and you are privileged to be there," she said. The privilege of dissecting a human body has been a part of medical education for more than 2,000 years. According to Tom Estenson, PhD, one of five faculty members who teach the course, the experience is vital to the education of future physicians and PAs. "Basically, you cannot learn human anatomy without access to a human body. The bodies donated to HSC educational purposes are invaluable resources," he said. Estenson and his students agree that other teaching tools, such as computerized dissection and models, play important roles in the educational process, but nothing can replace the actual experience. "Having this hands-on experience is very important," said Nick Andrews, an MD/PhD student from Albuquerque. "We are completely immersed in the experience and it is very real-there's nothing artificial about it," he said. Andrews said there is only so much one can learn from textbooks and photos. The bodies are necessary so that students can visualize where different organs are located, how they are related to other body parts, and what healthy and diseased tissue look like. The course also teaches students how much variation there is between humans. "People are unique. 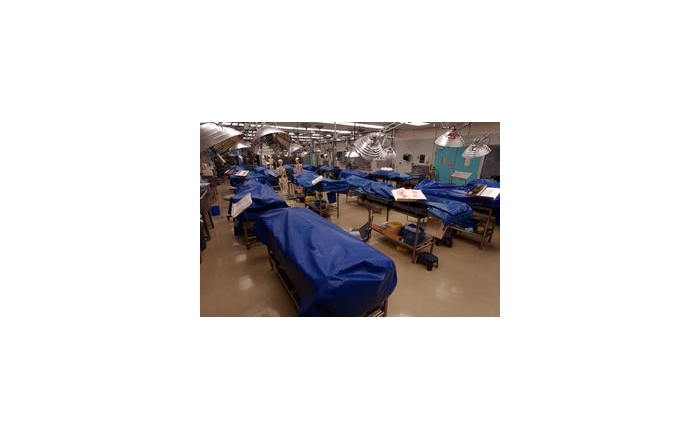 This semester we have 22 cadavers and they are all different," Estenson said. 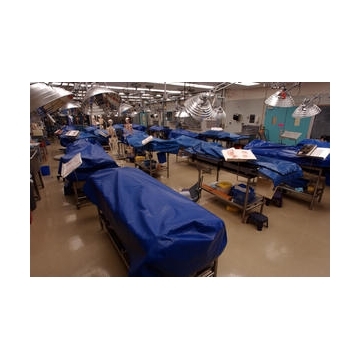 Students learn from all of the cadavers in the lab, and also from each other. Thai Verzone, a second-year PA student, said the opportunity to study side by side with future physicians is the primary reason he decided to enroll at UNM. "I did a lot of research and there are only a few PA programs in the country that do this," said Verzone, a native of Anchorage, Alaska. In addition to helping PA students become more proficient in their studies, Verzone believes, the experience has helped him better understand the rigors of medical school. This perspective, he said, will help him become a better physician's assistant. Making students better physicians and PAs is the ultimate goal of the course. However, Estenson said, there is more to this lesson than basic human biology. Students learn respect for human life and the emotions that accompany death-a necessary skill in their chosen professions. They also develop a great sense of respect for their patients and the gift of knowledge they have received from them. In fact, Estenson said, at the end of the semester students organize a memorial service for their donors. Often family members of the donors attend and students have the opportunity to thank them and learn more about the life of the person they have come to know so intimately. Although the idea of human dissection may be unpleasant, most people would agree they would not want a physician who had never worked with a real body. "Having the hands-on experience was very important to me," said Wright. "Now, when I read about an organ or other body part, I can actually see the real thing in my mind," she said. Wright believes this mental reference will remain with her throughout her education and career. "I don't think it will ever go away," she said, adding that a photo or a model would not have had the same lasting impression. Over the next few years, the information Wright and her fellow students learned during the gross anatomy course will fuse with a multitude of other data they have collected on the way to becoming physicians and physician's assistants. Some of this knowledge will stay with them forever, while some of it will fade away. One thing, however, is certain. They will always remember their first patient.